UDM Downloads > Easy Resume Creator Pro! Easy Resume Creator Pro helps you create a resume and cover letters that match your current career level, background and career objectives, and deliver those to multitudes of employers seeking just the qualifications you possess. The following tools assist you in building your career path. - Resume creation wizard - guides you step-by-step through the process of creating an individual resume that reflects your career level, experience and other individual information. - Letter creation wizard - guides you step-by-step through the process of creating an individual cover letter, letters accepting or rejecting an offer, and thank you correspondence. - Job Crawler - searches available jobs throughout dozens of online employment databases. Simply select your career field and desired keywords and hit Search. - Contact organizer - manages your prospective employers' contact information, your to-do list and personal calendar. - Resources - many career-related resources, which include federal employment forms and information, job boards and other useful links. 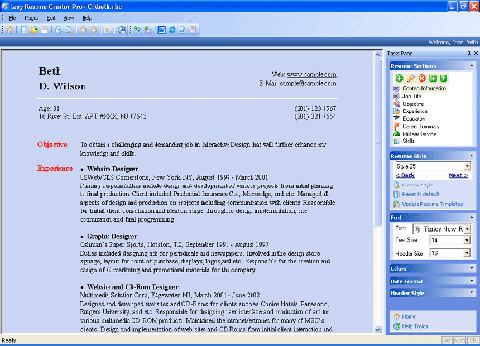 Easy Resume Creator Pro lets you create resumes in the following formats: MS Word, HTML, ASCII and HR-XML. You can deliver resumes, along with cover letters, to the prospective employer via mail. Easy Resume Creator Pro's Job Search is a tool for searching employment offers posted on different job boards. Start with the major jobs databases to see if they have positions that meet your interests. You can search by keyword, location, career field and other criteria. The trial version of the program carries the following search modules only: Dice, Monster, Monster Canada, and Spherion. Upon registration, you can unlock the rest of the modules, such as HotJobs, Google, TrueCareer, NetTemps, and more, available from the program directly. Easy Resume Creator Pro helps you reach your career objective and take the stress out of your job search.